When water is left alone, it makes a mess. It backs up into wetlands. Rivers overflow their banks. Mud and silt builds up, new channels open up. But Elijah Portugal, who studies how rivers and streams shape the land, says that that mess is what rivers need to be functional. “Messiness matters,” he says. Spring Creek wetland area in the parking lot of the South Logan Walmart Superstore. In this program, we’ll meet some of the people who have been responsible for cleaning up rivers: the state and federal agencies responsible for controlling water -- for making sure it doesn’t slow down or back up, that it gets to where we need it as efficiently as possible. We’ll also meet people who appreciate the messiness of streams in their natural states -- it’s that messiness that creates great habitat for fish and birds and a host of other ecosystem benefits. And we’ll meet the creatures that mess up watersheds in the best possible way. The hour is all about Beavers and Dams. The U.S. Bureau of Reclamation is a big part of our lives in the West. It’s the largest wholesaler of water, providing drinking water for 31 million people and irrigation for 10 million acres of farmland. But Dan Beard, the guy who used to be the head of the Bureau thinks it’s time to get rid of the agency entirely. And he’s advocating for tearing down some of the monuments of the Bureau’s glory days: the large dams that are as iconic to the West as sagebrush. Beard has packaged his ideas into a new book called Deadbeat Dams. Jennifer Pemberton interviewed the author when he was in Utah on his book tour. 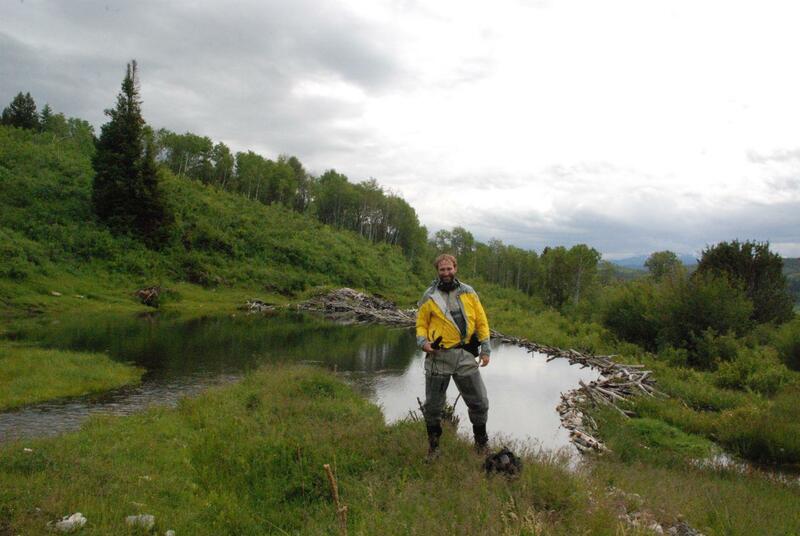 Reporter Ross Chambless sporting his waders for his trip to Spawn Creek in Logan Canyon. Reporter Ross Chambless straps on his waders and follows Professor Joe Wheaton up to the headwaters of the Logan River to see how beavers can engineer a stream system. Then he talks to state wildlife biologist Kent Sorenson about how Utah balances the work that beavers do with the work that can be done with front end loaders. A small wetland area was spared when the South Logan Walmart Superstore went in. After repeated attempts to get rid of the beaver living there, Walmart and the City of Logan are going to try "Living with Beaver." There’s a wetland area at the South Logan Walmart Superstore. Somehow it’s never been paved over and it’s home to a family of beaver. Jennifer Pemberton tells the story of a collaboration between the city of Logan, university researchers, Walmart Stores and the Bear River Watershed Council to keep the beaver living happily and harmlessly in the Walmart parking lot. The state of Utah is eyeing the Bear River as a source of water for the future population of Utah, which will double by 2060. Despite a movement away from dams and toward letting rivers be themselves, the state’s plans for the Bear River includes a series of dams and reservoirs. Marisa Egbert is a project manager for the Utah Division of Water Resources. Jennifer Pemberton talked to her about the tough job she has trying to create a development plan that will best serve a growing population while facing opposition to building dams and taking water out of the river before it reaches the Great Salt Lake. The man who used to head the nation’s dam-building agency is now advocating for tearing them down. The Source’s Jennifer Pemberton talked to Dan Beard, author of Deadbeat Dams: Why We Should Abolish the U.S. Bureau of Reclamation and Tear Down Glen Canyon Dam. The U.S. Bureau of Reclamation has left an indelible mark on the West, helping homesteaders use the desert river systems to not only make themselves at home but also to create opportunity for their economic viability.